A WELLESBOURNE comic magician and cruise ship entertainer has taken on a comedy routine to perform with mice. Mel Harvey, who is famous for appearing on Rainbow, The Sooty TV Show, theatre tour Presto the Magic Rabbit and with many other showbiz acts, bought the rights to use magical mice tricks from the recently-retired magician Frankie Holmes. Mr Harvey bought the mice from a pet shop in the village three weeks ago. He has been working with Pip and Squeak ever since and the mice have been added to the line-up. Currently he is in the process of getting the mice passports so they can accompany him on his future cruise performances. The mice are involved in a three-minute box trick and the mice will always perform at the end of the show. Mr Harvey said: "They are basically kept as pets and there is no animal cruelty involved at all. Frankie Holmes performed a box trick with mice for over 40 years. Pip and Squeak are well looked after and live in a two-tier home at my house." This autumn, he returned to WeIlesbourne after completing his world tour, Magical Mayhem and is performing a range of variety shows in the UK. Mr Harvey attends a variety of functions in Wellesboume including birthday parties, anniversaries and he also attended the Macmillan nurses' open day to perform magic. This Saturday he will perform at A B Plus in Birmingham to children who have immunological deficiencies. He is set to perform several variety shows across the Christmas period including a stage show at the Winter Gardens in Margate on 28th and 29th December. 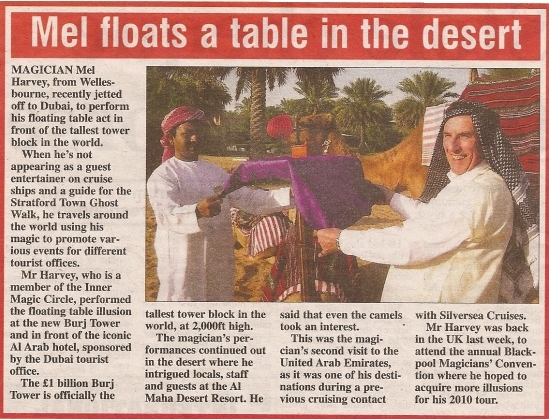 In January, Mr Harvey will attend a dinner at Billesley Manor Hotel for a cabaret performance.